*Below is a summary of our committee structure and membership information as at 31 Dec 2017. Mr Ang Swee Tian is the Non-Executive Chairman of Singapore Mercantile Exchange Pte Ltd and an Independent, Non-Executive Director of Cosco Corporation (Singapore) Limited. In the light of continuing uncertainties in the global economies and increasingly challenging competitive business environment, the Board of Directors (the “Board”) and Management of China Aviation Oil (Singapore) Corporation Ltd (“CAO” or the “Company”) remained committed to achieving the highest standards of corporate governance and in keeping with the Company’s corporate philosophy of transparency and integrity. We strive to surpass the minimum requirements of openness, integrity and accountability prescribed by the Singapore Exchange Securities Trading Limited (the “SGX-ST”) and the recommendations of the Code of Corporate Governance (the “2012 Code”). Good corporate governance has become a fundamental part of our corporate culture and business practices of the CAO group (the “CAO Group”) and in ensuring the continued strong performance of our businesses and maintaining investor confidence which underpin the sustainable, long-term growth of our businesses and shareholder value. Since the adoption of the CAO Corporate Governance Policy in August 2012 which corporate governance principles and guidelines are devised in line with the principles and guidelines set out in the 2012 Code (the “CAO Corporate Governance Policy”), significant efforts have been made by relevant departments mandated with the responsibility to oversee the adoption of the CAO Governance Policy in their practices, processes and operations. The corporate governance practices of the CAO Group and the CAO Corporate Governance Policy are reviewed regularly and are continually fine-tuned and enhanced to ensure that they remain relevant and effective in light of the changing legal and regulatory requirements and volatilities of the trading business and operating environment. We confirm that throughout the financial year ended 31 December 2017 and at the date of issue of this Statement of Corporate Governance, we were in substantial compliance with the provisions of, and applied the principles set out in the 2012 Code. With the view to preserving and growing shareholder value through strong and effective corporate governance, the Board has put in place a set of well-defined and sound systems of internal controls and processes which the Company voluntarily subjects them to biennial review by an independent third party consultant. This report primarily describes the Company’s corporate governance practices for the financial year ended 31 December 2017 with specific reference to the 2012 Code and details how we apply the principles and comply with the provisions of the 2012 Code. Every company should be headed by an effective Board to lead and control the company. The Board is collectively responsible for the success of the company. The Board works with Management to achieve this and the Management remains accountable to the Board. Composition of the Board: At the date of issue of this Statement of Corporate Governance, the Board comprises seven (7) Non-Executive Directors, the Chief Executive Officer/Executive Director (the “CEO/ED”) and the Executive Director/Vice President. All Independent Directors as well as those nominated by the two (2) major shareholders, namely China National Aviation Fuel Group Limited (“CNAF”) and BP Investments Asia Limited (“BP”), were appointed on the strength of their expertise, experience and stature. The Board is composed of members who are diverse in terms of education, skills, regional and industry experience, geographical origin, interpersonal skills, race, gender and age. Details including the academic and professional qualifications and major appointments of each Director are provided under the “Board of Directors” section of this Annual Report. The Board recognises and embraces the importance of Board diversity which aims to cultivate a broad spectrum of demographic attributes and personal characteristics in the boardroom, leveraging on differences in thought, perspective, knowledge, skill, regional and industry experience, cultural and geographical background to ensure that the Company retains its competitive advantage. The Board has put in place Internal Policy Guidelines on Board Diversity to provide guidance to the Nominating Committee in reviewing and assessing the appropriate mix of diversity, skills, experience and expertise required on the Board and the Board Committees of the Company, and the extent to which the required skills and core competencies are represented on the Board. In carrying out its responsibilities in accordance with the said Internal Policy Guidelines on Board Diversity, the Nominating Committee will take into account the Company’s diversity objectives as well as the need to maintain flexibility to effectively address Board renewal and succession planning at Board level and to ensure that the Company continues to attract and retain highly qualified individuals to serve on the Board and Board Committees. which will include: (i) driving better business performance and results; (ii) making corporate governance more effective; (iii) encouraging a wider range of ideas and options and ensuring high quality and responsible decision-making capability; and (iv) ensuring sustainable growth and development of the CAO Group. Group and for its overall strategic direction, its values and its governance. They provide the Company with the core competencies and the leadership necessary for the CAO Group to meet its business objectives within the framework of its systems of internal controls and processes. All members of the Board are aware of their responsibility to take decisions objectively which promote the success of the CAO Group for the benefit of shareholders. The CAO Corporate Governance Policy sets forth the matters reserved for the Board’s decision, and provides clear directions to Management on matters that must be approved by the Board. In addition, Management has the responsibility for overseeing the implementation by the CAO Group’s operating subsidiaries of the policies and strategy set by the Board, and for creating the framework for their successful day-to-day operation. e)	ensuring accurate, adequate and timely reporting to, and communication with shareholders. material acquisitions and disposals of assets, corporate or financial restructuring, formulation of any dividend policy or the change of such dividend policy, declaration of dividends, interested person transactions and any appointment, re-appointment or removal of the Chairman of the Board. Apart from matters specifically reserved for Board’s consideration and decision, the Board will approve transactions exceeding certain threshold limits, whilst delegating authority for transactions below those limits to Board Committees and the Management for approval. Delegation of Authority to Board Committees: To ensure the efficient discharge of its responsibilities and to provide independent oversight of Management, various Board committees namely, the Audit Committee, the Nominating Committee, the Remuneration Committee and the Risk Management Committee have been constituted with clear written terms of reference. Each Committee has the authority to examine issues relevant to their terms of reference and to make recommendations to the Board for action. The ultimate responsibility and decision on all matters still lies with the Board. During the financial year, a review and assessment on the adequacy of the terms of reference of each of the Board Committees had been undertaken. For greater certainty and clarity in the delegation of authority to the Audit Committee and the Risk Management Committee, the scope of duties and responsibilities of these Board Committees were further fine-tuned. To optimise operational efficiency, the Company reviewed and updated its financial authorisation and approval limits for purchases and expenses requisitions as well as expenses/fees relating to costs of sales (within and outside the approved full-year budget) in tandem with the business operational needs. (1) Mr Felipe Arbelaez, a BP-nominee Director, resigned as a Non-Executive, Non-Independent Director on 28 July 2017. He concurrently relinquished his office as Chairman of the Risk Management Committee and as a member of the Audit Committee. (2) Mr David Windle, a BP-nominee Director, was appointed as a Non-Executive, Non-Independent Director on 28 July 2017. He was concurrently appointed as Chairman of the Risk Management Committee and as a member of the Audit Committee. (3) Dr Luo Qun, a CNAF-nominee Director, resigned as a Non-Executive, Non-Independent Director on 5 February 2018 and in his place, Mr Wang Yanjun who is Vice President of the Company, was appointed as an Executive Director. Dr Luo had also concurrently relinquished his office as Vice Chairman of the Nominating Committee and Remuneration Committee. (4) Dr Zhao Shousen, a CNAF-nominee Director, resigned as a Non-Executive, Non-Independent Director on 5 February 2018 and had concurrently relinquished his office as Vice Chairman of the Audit Committee and as a member of the Risk Management Committee. Mr Li Yongji, a CNAF-nomineee Director,was appointed as a Non-Executive, Non-Independent Director in place of Dr Zhao on 5 February 2018. Mr Li Yongji was concurrently appointed as (i) Vice Chairman of the Audit Committee, the Nominating Committee and the Remuneration Committee; and (ii) a Member of the Risk Management Committee. Includes a CAO 2020 Board Strategy Workshop held on 27th and 28th July 2017. Meetings of the Board and Board Committees, Independent Directors’ Meeting and the Annual General Meeting of the Company for each year are scheduled some time in the month of July in the preceding year to facilitate the Directors’ individual administrative arrangements in respect of any competing commitments. explaining their duties and obligations as a Director as well as the governance policies and practices of the CAO Group. In addition, the formal letter of appointment sets out their expected time commitment and make clear that, by accepting the appointment,they are confirming that they are able to meet the expectations of their role. They are also required to disclose their other significant commitments to the Board prior to their appointment and to give notice of any subsequent changes. Comprehensive and tailored training is provided for all new Directors appointed to the Board as part of their orientation to ensure that they are familiar with (i) the Company’s strategic objectives and the nature and scope of its operations; (ii) the Board’s role and the governance structure and processes of the Company; (iii) Directors’ duties and responsibilities under statute and common law;(iv) applicable legal requirements and other regulatory requirements; (v) broad overview on the rules of SGX-ST Listing Manual; and (vi) the CAO Corporate Governance Policy. Facility visits to our associated companies’ premises are also arranged to enable newly appointed Directors to acquire an understanding of the CAO Group’s business operations. During the year, comprehensive Director familiarisation sessions were arranged for Dr Xi Zhengping and Mr David Windle who joined the Board in February 2017 and July 2017 respectively. The purpose of the familiarisation sessions was to familiarise them with the business activities, strategic direction, policies and corporate governance practices of the CAO Group. Areas covered included 2020 Corporate Strategy, oil trading and aviation marketing businesses of the CAO Group, risk management framework, policies and practices, overview of the financial performance of the CAO Group, Directors’ Duties and Continuing Listing Obligations and Governance Structure of the CAO Group. These sessions also provided opportunities for the aforesaid Directors to get acquainted with senior management, and also foster better rapport and communications with Management. In addition, as part of the Director familiarisation programme for Dr Xi Zhengping, a presentation on “Corporate Governance Principles and Directors’ Legal Duties and Responsibilities” was conducted in Mandarin by Mr Chia Kim Huat of Rajah & Tann LLP. Arrangements were also made for Dr Xi Zhengping to “meet and greet” with the senior management of the SGX-ST. Continuing Professional Development of Directors: In line with CAO’s Policy on Director Orientation and Professional Development adopted by the Board since November 2012, continuing professional development programmes were organised for Directors to ensure that all Directors are updated on important market developments in the energy industry and issues which may have a significant impact on the businesses, financial and operational matters of the CAO Group. These programmes are conducted by external advisers, experts or senior management and these included: (i) a Board Information Session relating to “Price Risk Management and Hedging” conducted by Mr Iain Lawson, Head of Structured Products for BP Integrated Supply & Trading-Eastern Hemisphere, Singapore; and (ii) Sustainability Reporting Requirements and Implementation Roadmap conducted by KPMG Corporate Advisory Services Pte Ltd.
Directors’ Disclosure of Interests: The Board has established the Board of Directors Conflict of Interest Policy (the “Board Conflict of Interest Policy”) which is adjunct to the Company’s overarching commitment to high levels of integrity and transparency. The Board Conflict of Interest Policy is designed to facilitate the identification of situations that present actual, perceived or potential conflicts of interest and the procedures to appropriately manage conflicts in accordance with legal requirements and the goals of accountability and transparency in the CAO Group’s operations. All Directors are required to officially disclose their interests in the Company including any interested person transactions with the Company. Any Director who has an interest that may present a conflict between (a) his or her obligation with the Company and his or her personal business or other interests; and/or (b) the interests of the appointing major shareholder and the interests of the Company on which he or she serves, will either recuse himself or herself from participating in the deliberations and voting on the matter or declare his or her interest and abstain from decision-making. All Directors practise good governance by updating the Company about changes to their interests in a timely manner. There should be a strong and independent element on the Board, which is able to exercise objective judgment on corporate affairs independently, in particular, from Management and Substantial Shareholders. No individual or small group of individuals should be allowed to dominate the Board’s decision making. Composition of Independent Directors on the Board: Of the nine (9) members on the Board, six (6) are nominated by substantial shareholders and are deemed as non-independent. The three (3) Independent Directors namely, Dr Wang Kai Yuen, Mr Ang Swee Tian and Mr Li Runsheng constitute at least one-third of the Board. Currently, at least two (2) Independent Directors are resident in Singapore. These two (2) Independent Directors are Dr Wang Kai Yuen and Mr Ang Swee Tian. None of the nine (9) Board members is related to one another. Independent Element of the Board: The Nominating Committee assesses and determines the independence of a Director upon appointment and on an annual basis. The Nominating Committee takes into consideration CAO’s Internal Policy Guidelines on Directors’ Test of Independence which set out the process for considering the independence of Directors of the Company (the “Directors’Test of Independence Policy”). The Directors’ Test of Independence Policy (i) specifies the materiality thresholds and independence criteria which the Nominating Committee will use to assess the independence of a Director; (ii) identifies the information that the Company will collect from Directors to enable the Nominating Committee to assess the independence of Directors; and (iii) outlines the basis of disclosure to shareholders of the assessment of the independence of Directors, including the disclosure of any relationships that may be perceived to affect the independence or objectivity of a Director. The Nominating Committee carried out the review on the independence of each non-executive Director in September 2017 by taking into consideration the Directors’ Test of Independence and the information collected from each Director through the completion by each Director of a confirmation of independence checklist. The Director is required to declare any circumstances in which he or she may be considered non-independent. The Nominating Committee will then review the confirmation of independence checklist by applying the Directors’ Test of Independence before affirming the independence of a Director. Under the 2012 Code and in accordance with the CAO Corporate Governance Policy, the Nominating Committee is tasked with the responsibility to undertake a “particularly rigorous review” of a director’s independence after he or she has served on the Board for a continuous period of nine (9) years or longer term from the date of his or her first appointment. If the Nominating Committee decides to regard such a director independent, the Nominating Committee shall disclose its explanation in the Company’s annual report. As of the date of this report, Independent Directors namely, Dr Wang Kai Yuen and Mr Ang Swee Tian, each held office for a term of slightly more than nine (9) years. At the time of the Nominating Committee’s review on the independence of each non-executive Director of the Company, the Form of Directors’ Declaration relating to the Director’s Independence had been modified to facilitate the Nominating Committee’s assessment of the independent status of the aforesaid long-tenured Independent Directors of the Company. These questions require the long-tenured Independent Directors of the Company to consider and provide their inputs and/or comments reaffirming their ability to make unfettered independent business judgements. In the Form of Director’s Declaration for 2017, both Dr Wang Kai Yuen and Mr Ang Swee Tian had confirmed that there were neither any circumstances that could have materially interfered with their exercise of unfettered and independent judgment nor were there any occurrence of any circumstances where the interests of CAO might not be best served by the interests of the major shareholders of CAO. This is evident from the minutes of the proceedings of the Board and relevant Board Committees over the past years, where each of Dr Wang Kai Yuen and Mr Ang Swee Tian had expressed his individual viewpoints and objectively scrutinised and sought clarifications from the Management, employees, external auditors and internal auditors of CAO as he considered necessary. Both have demonstrated their independence in character and judgement in discharging their duties and responsibilities as Directors of the Company and their ability to act in the best interests of the Company and its shareholders generally. The Board accepted the Nominating Committee’s view and affirmed the independence of these Directors. The composition of the Board is reviewed annually by the Nominating Committee. The Nominating Committee is satisfied that the Board comprises Directors who as a group possess the necessary calibre, experience and core competencies for effective decision-making. Individual directors’ profiles can be found in “Board of Directors” section of the Annual Report. All Singapore-listed companies are required to comply with Guideline 2.2 of the 2012 Code and make the necessary Board composition changes at the annual general meeting following the end of financial years commencing on or after 1 May 2016. In this regard, the Company would need to effect the Board composition changes no later than its annual general meeting in April 2018. The rationale of Guideline 2.2 of the 2012 Code is basically intended to prevent any one (1) major shareholder from dominating the decision-making process of the Board where the Chairman of the Board and the Chief Executive Officer are both nominated by the same major shareholder. Although the Chairman of the Board is not an Independent Director of the Company, the composition of the Board of Directors of the Company presently comprises representatives from its two (2) major shareholders namely, CNAF and BP. As such, there already exists an appropriate level of checks and balances in the management and operation of the Company via the Shareholders’ Agreement. In addition, the Company had appointed the Lead Independent Director, who is also concurrently the Deputy Chairman of the Board. Hence, considering that the safeguards for a balanced Board are already in place, the Board is of the view that it would be appropriate to maintain the present Board composition of the Company for the foreseeable future. Separate Role of Chairman and CEO: The Chairman, with the assistance of the Deputy Chairman, is primarily responsible for overseeing the overall management and strategic development of the Company. With the assistance of the Company Secretary,the Chairman schedules Board meetings and ensures that all procedures and good governance practices are complied with. The CEO/ED consults both with the Chairman and the Deputy Chairman for their views on the agenda for Board meetings. The CEO/ED executes the Board’s decisions and is responsible for the day-to-day running of the Company’s business, making operational decisions for the Company and implementing the Company’s business, direction, strategies and policies. The Chairman regularly consults with the Deputy Chairman/Lead Independent Director as well as other members of the Board and Board committees on major issues. As such, the Board believes there are adequate safeguards in place against having a concentration of power and authority in a single individual. The Chairman and the CEO/ED are not related to each other. The list of responsibilities of the Chairman and the CEO/ED is available for inspection at the Company’s registered office. Regular Meetings of Independent Directors: In accordance with the CAO Corporate Governance Policy, the Independent Directors of CAO meet at least once a year, without the presence of the other Directors, to discuss any matters relevant to the CAO Group, such as its investment criteria, risk management and internal controls, risk appetite and risk tolerance, performance of management, Board communication and performance, and strategic issues. Led by the Deputy Chairman/Lead Independent Director, the Independent Directors of CAO held their meeting on 21 November 2017 without the presence of the other Directors. Key issued discussed by the Independent Directors of CAO included the “Re-looking the Evolving Role of Independent Directors in Corporate Governance”, “Key Audit Matters and Sustainability Reporting”, “Adoption of New IFRS-identical Financial Reporting Framework” and “CEO Succession Planning”. There should be a formal and transparent process for the appointment of new Directors to the Board. (1)Mr Li Yongji was appointed as Vice Chairman on 5 February 2018 in place of Dr Luo Qun. The Chairman of the Nominating Committee is not associated with any substantial shareholder of the Company. g) the review of the management structure of key operating subsidiaries of the Company and evaluation of the performance of key management personnel of these key operating subsidiaries, as and when proposed by any Director. Board Nomination Process for the Selection and Appointment of New Independent Directors: The Nominating Committee will generally apply the Internal Guidelines for Selection and Appointment of Independent Directors of CAO (the “Internal Guidelines”) for the process of identifying, evaluating and selecting suitable candidates for appointments as new Independent Directors of the Company. In considering the overall balance of the Board’s composition, the Nominating Committee will give due consideration to the selection and evaluation criteria set out in the Internal Guidelines, having regard to the normally accepted nomination criteria which include but not limited to (i) the appropriate background, experience, industry knowledge or ability to acquire that knowledge, professional skills and qualifications; (ii) demonstrated, willingness to devote the required time, including being available to attend meetings of the Board and Board Committees; and (iii) high levels of personal and professional integrity as well as business ethics. In the case of selection and appointment of CNAF-Nominee Directors and BP-Nominee Directors, the Nominating Committee will not apply the Internal Guidelines. However, with regard to the nominations received from either CNAF or BP for the appointment and/or replacement of their respective nominee Directors, the Nominating Committee may apply the relevant evaluation criteria in the Internal Guidelines when assessing their suitability in complementing the core competencies of the Board at that time. (ii) where the individual is a full-time independent director. All Directors of the Company have complied with the requirement on the Maximum Number of Listed Board Representations. The Nominating Committee had reviewed each Director’s external directorships as well as the Director’s attendance and contributions to the Board. Despite the multiple directorships of some Directors, the Nominating Committee is satisfied that all of the Directors of the Company have complied with the requirement on the Maximum Number of Listed Board Representations. The Nominating Committee is also satisfied that the Directors spent adequate time on the Company’s affairs and have carried out their responsibilities. Retirement by Rotation and Re-election of Directors: Pursuant to Article 91 of the Company’s Constitution, one-third of the members of the Board of Directors shall retire by rotation at every annual general meeting of the Company (the “AGM”) and these Directors may offer themselves for re-election, if eligible. For the 24th AGM to be held on 25 April 2018, Mr Meng Fanqiu and Ms Bella Young Pit Lai are due for retirement by rotation and would be eligible for re-election. The Nominating Committee has recommended and the Board agreed that Mr Meng Fanqiu and Ms Bella Young Pit Lai, the Directors retiring by rotation under Article 91, be nominated for re-election at the 24th AGM. In accordance with Article 97 of the Company’s Constitution, (i) Mr David Windle who was appointed as a Non-Executive,Non-Independent Director of the Company on 28 July 2017; (ii) Mr Li Yongji who was appointed as a Non-Executive, Non-Independent Director of the Company on 5 February 2018; and (iii) Mr Wang Yanjun who was appointed as an Executive Director of the Company on 5 February 2018, each will hold office as Directors until the next annual general meeting of the Company and will be eligible for re-election under Article 97 at the 24th AGM. Board Performance: The Nominating Committee evaluated the performance of each Director and the effectiveness of the Board as a whole. Since the adoption of the CAO Corporate Governance Policy in 2012, the Board has, through the Nominating Committee, implemented a formal process annually for assessing the effectiveness of the Board as a whole and its Board Committees (the “Overall Board/ Board Committees’ Performance Evaluation”). The Overall Board/Board Committees’ Performance Evaluation entailed the completion by each member of the Nominating Committee of a Board assessment and effectiveness questionnaire (the “Board Evaluation Questionnaire”). The elements of the Board Evaluation Questionnaire included questions on (i) the Board’s composition; (ii) Board’s access to information prior to Board meetings and on an ongoing basis to enable them to properly discharge their duties and responsibilities as Directors; (iii) the expertise and experience of each member of the Board; (iv) the conduct of proceedings of meetings, participation and contributions to the Board both inside and outside of Board meetings; (v) the assessment of the performance benchmark for assessing the performance of the Board as a whole and in ensuring the continued return for shareholders; and (vi) the standard of conduct in preventing conflicts of interest and the disclosure of personal interests and abstention from voting where appropriate. Nominating Committee for last three (3) preceding years were also sent to the members of the Nominating Committee. Each member of the Nominating Committee would first carry out his own assessment and evaluation of the performance of the Board as a whole and its Board Committees using the Board Evaluation Questionnaire. To further enhance the long-term performance of the Board and its Board Committees, a separate process for the review of the performance of individual (non-executive) directors was also adopted (the “Individual Board Member Performance Evaluation”) and conducted on an annual basis concurrently with the Overall Board/Board Committees’ Performance Evaluation. The Individual Board Member Performance Evaluation was conducted using the 360-Degree Board Member Evaluation Form. The 360-Degree Board Member Evaluation Form was designed to facilitate the assessment of each individual (non-executive) Board member in areas such as “Leadership”, “Strategic Thinking”, “Board Contribution” and “Governance”. The 360-Degree Board Member Evaluation Form was emailed to Directors individually by separate emails and each Board member was required to complete the 360-Degree Board Member Evaluation Form for each of the other non-executive Directors, on an anonymous basis. A general summary of (i) the assessment ratings on each of the elements of the Board Evaluation Questionnaire by each member of the Nominating Committee; and (ii) the results of assessment and evaluation of the 360-Degree Board Member Evaluation Form for each non-executive Director of CAO, will be collated by the Company Secretary for the Nominating Committee’s deliberation and consensus at its Nominating Committee Meeting held in November each year. During the year, each of the Board committees also conducted an annual self-evaluation to assess its effectiveness as a whole and explored ways to further enhance its effectiveness. The Nominating Committee is satisfied with the current composition and performance of the Board both individually and as a whole. In order to fulfil their responsibilities, Directors shall be provided with complete, adequate and timely information prior to Board meetings and on an on-going basis so as to enable them to make informed decisions to discharge their duties and responsibilities. Information Flow: The Company has put in place enhanced communication processes between the Board and Management in terms of information flow. Agenda for meetings and all Board papers for discussions are circulated to Directors at least ten (10) days in advance so that the Directors are prepared for the meetings. However, sensitive matters may be tabled at the meeting itself or discussed without any papers being distributed. Management and senior executives of the Company would be present during the Board meeting or Board Committee meeting, as the case may be, to present their proposals or to answer any questions that Board members may have. The Board as a whole as well as individual Directors have direct access to Management represented by senior executive officers of CAO and the CAO Group. The Management provides the Directors with monthly updates on the operational and financial performance of the CAO Group, and also responds to regular questions from the Board or individual Directors in a timely manner. Where the Board deems it necessary, the Board can obtain independent advice from external consultants. This enhances the Board’s ability to discharge its functions and duties. All Board members have direct access to and the advice and services of the Company Secretary. The Company Secretary attends the meetings of the Board and Board Committees and assists the respective Chairman of the Board/Board Committees in ensuring that Board/Board Committee papers, procedures and the applicable laws and regulations are adhered to. Information about CAO and the CAO Group are freely available to each Board member. Management will promptly supply any additional information that the Board requires. The Board also has ready access to external professionals for consultations. The level and structure of remuneration should be aligned with the long-term interest and risk policies of the company, and should be appropriate to attract, retain and motivate (a) the Directors to provide good stewardship of the company; and (b) key management personnel to successfully manage the company. However, companies should avoid paying more than is necessary for this purpose. Each company should provide clear disclosure of its remuneration policies, level and mix of remuneration, and the procedure for setting remuneration, in the company’s annual report. It should provide disclosure in relation to its remuneration policies to enable investors to understand the link between remuneration paid to directors and key management personnel, and performance. Remuneration Committee: The Board adopted the recommendations of the 2012 Code and established a Remuneration Committee to consider and to make recommendations on remuneration matters for the Directors and key management personnel of the CAO Group. Apart from ensuring consistencies with good practices, the Remuneration Committee is also mindful of the need to ensure that the Company and the CAO Group are able to attract and retain good Directors and senior executives to the business. Mr Li Yongji was appointed as Vice Chairman on 5 February 2018 in place of Dr Luo Qun. Executive Directors and key management personnel of the Company. In the discharge of its responsibilities, the Remuneration Committee has sought expert advice from an external international human resource consultancy firm. Broadly, remuneration for the CEO/EO and five (5) key management personnel for the financial year ended 31 December 2017 is based on the Company’s and individual performances and the remuneration for Non-Executive Directors in the form of fees is based on responsibilities and memberships in the Board and its committees. Non-executive Directors are paid Directors’ fees, subject to the approval of shareholders at the AGM. Directors’ fees comprise a basic fee and fees in respect of service on the Board committees. The structure for the payment of Directors’ fees for Non-Executive Directors is based on a framework comprising basic fee and additional fees for serving on the Board Committees and also undertaking additional services for the CAO Group. Fees paid or payable to Non-Executive Directors take into account factors such as effort and time spent, and responsibilities of these Directors. The CEO/ ED does not receive Directors’ fees for his Board directorships with the Company. (a) each director will receive a base fee (“Base Fee”). (b) the Chairman of the Board will receive twice the amount of the Base Fee. (“Board Chairman’s Fee”). (c) the Deputy Chairman will receive 75% of the Board Chairman’s Fee. (d) the Chairman of the Audit Committee (“AC”) will receive additionally two-thirds of the Base Fee (“AC Chairman’s Fee”). (e) the Chairman of the Risk Management Committee (“RMC”) will receive additionally two-thirds of the Base Fee (“RMC Chairman’s Fee”). (f) Chairman of the Remuneration Committee (“RC”) and the Chairman of the Nominating Committee (“NC”) will each receive additionally one-third of the Base Fee. (g) members of AC, RC, NC and RMC will each receive 50% of the respective AC Chairman’s Fee, RC Chairman’s Fee, NC Chairman’s Fee and RMC Chairman’s Fee. (h) Executive Directors will not be entitled to receive fees. (i) the Lead Independent Director will receive additionally a sum equivalent to the Base Fee. Directors’ fees which were payable to non-executive Directors nominated by CNAF and BP were previously paid to CNAF and BP or their nominated companies respectively. As a gesture of their continued support to the Company, both CNAF and BP had decided not to accept any Directors fees payable to their respective nominee Directors from the financial year 2017. (1) The total remuneration of Mr Meng Fanqiu shown above excludes the 2017 variable bonus payable for the financial year 2017. The quantum of the said 2017 variable bonus is being considered by the Remuneration Committee and will be decided and recommended for the Board’s endorsement during the financial year 2018. (2) Dr Xi Zhengping was appointed as Chairman/Non-Independent Director in place of Mr Lin Wanli on 6 February 2017. (3) Mr David Windle was appointed as Non-Executive, Non-Independent Director in place of Mr Felipe Arbelaez on 28 July 2017. (2) The remuneration disclosed comprises secondment fees paid to BP Singapore Pte Ltd (“BPS”) pursuant to a secondment agreement between CAO and BPS. (3) Mr Wang Yanjun and Mr Zhang Xingbo were appointed as Vice Presidents during the third quarter of 2017 whilst Mr Xu Guohong was appointed as Chief Financial Officer during the fourth quarter of 2017. There are no employees in the CAO Group who are immediate family members of the Chairman or any of the Directors during the financial year ended 31 December 2017. “immediate family member” means the spouse, child, adopted child, step child, brother, sister and parent. The remuneration of the CAO Group’s five (5) key management personnel takes into consideration the pay and employment conditions within the same industry and is performance related. Basic/fixed salary – The basic salary (inclusive of statutory employer contributions to Central Provident Fund) for the CEO/ED and each key management personnel were approved by the Remuneration Committee and endorsed by the Board, taking into account the performance of the individual for the financial year 2017, the inflation price index and information from independent sources on the pay scale for similar jobs in a selected group of comparable organisations. Variable/Performance – The CAO Group operates a bonus scheme for all employees including the CEO/ED. The criteria for the bonus scheme are the level of profit achieved from certain aspects of the CAO Group’s business activities against targets, together with an assessment of the Company’s and individual’s performance during the year. The remuneration disclosed above for the CEO/ ED and the five (5) key executives included the 2016 variable bonuses payable in relation to profit targets achieved for the Company’s oil trading activities during the financial year 2016. Others – Benefits in kind such as private medical cover and car are made available where appropriate and consistent with common industry practices. The Board, with the assistance of the Audit Committee, reviewed all financial statements of the Company and the CAO Group. The Board is accountable to shareholders and always aims to present a balanced and understandable assessment of the Company’s and the CAO Group’s financial position and prospects to shareholders on a timely basis. The quarterly, half-year and full-year results were announced or issued within the mandatory period. The Board also ensures that timely announcements of other matters as prescribed by the SGX-ST Listing Manual requirements and other relevant rules and regulations are made. Board members are provided with management accounts on a monthly basis. Such reports keep the Board informed, on a balanced and understandable basis, of the CAO Group’s performance, financial position and prospects and consist of the consolidated profit and loss accounts, analysis of sales, operating profit, pre-tax and attributable profit by business segments compared against the budgets, together with explanation given for significant variances for the month and year-to-date. The Board had put in place an external audit policy (the “CAO External Audit Policy”) which provides guidance on the application of the 2012 Code as well as CAO Corporate Governance Policy in relation to the provision of external audit services for the CAO Group. The Audit Committee, in accordance with its terms of reference, reviews the performance of the external auditors on an annual basis. In reviewing the performance of the external auditors, the Audit Committee will focus on the quality and rigour of the audit (e.g. assessment of the effectiveness of the external audit through levels of errors identified, accuracy in handling key accounting audit judgments and response to queries from the Audit Committee); quality of audit services provided, the audit firm’s internal quality control procedures, relationship with internal auditors and the Company; and the independence and objectivity of the external auditors. In line with the prevailing regulatory requirements of the State-owned Assets Supervision and Administration Commission of the State Council of the People’s Republic of China, which has jurisdiction over CNAF, which is a state-owned enterprise of the People’s Republic of China, and over the Company as CNAF’s subsidiary, the same audit firm should not be retained for more than five (5) consecutive full-year audits. During the financial year 2017, the Board, through the Audit Committee, Deloitte Touche LLP (“Deloitte”) and internal auditors, BDO LLP (“BDO”), scrutinised Management’s conduct of the Company’s and the CAO Group’s business processes and financials. Each area of the Company and the CAO Group was audited on an ongoing basis to ensure that the Company and the CAO Group maintain good corporate practices and governance and financial integrity. The Board recognises the importance of sound internal control and risk management practices. In this regard, the Board affirms that it is responsible for the CAO Group’s systems of internal control and risk management system and had established the Risk Management Committee. (1) Mr David Windle was appointed as Chairman of the Risk Management Committee in place of Mr Felipe Arbelaez on 28 July 2017. (2) Mr Li Yongji was appointed a member of the Risk Management Committee in place of Dr Zhao Shousen on 5 February 2018. (iii) overseeing the risk management practices of the CAO Group. (ii) all risk-related policies, processes and limits are implemented and adhered to. The Head of the Risk Management Department, a BP-secondee, reports directly to the Risk Management Committee. The Risk Management Committee had delegated the day-to-day management of the risks of the Company and the CAO Group to the Company Risk Meeting, which operates within the delegated authority set by the Risk Management Committee from time to time. The Company Risk Meeting comprises the Head of Risk Management, senior Management and relevant functional heads (i.e. from Trading, Operations, Finance and Legal), and meets once a month as well as on an ad hoc basis when required. The Chairman of the Company Risk Meeting, who is the Head of Risk Management, directly reports to the CEO/ED but also has an independent direct reporting line to the Risk Management Committee. The Risk Management Report is found on page 81 of the Annual Report. (xii) evaluating the system of internal controls for new projects and business activities and analysis on the impact of such activities on the CAO Group. Where necessary, to provide recommendation and develop programmes for improvement. report directly to the Audit Committee for important matters or concerns relating to the system of internal controls of the CAO Group. As part of the CAO Group’s efforts to ensure all employees of the CAO Group stay relevant and informed of the dynamic business environment and uphold core ethics and values that are essential to the long-term success of the CAO Group, the Compliance and Internal Audit Department arranged for all employees of the CAO Group to participate in the mandatory e-learning course modules relating to (1) Global Sanctions; (2) Information Security; and (3) Fraud Prevention via the Thomson Reuters’ online learning portal. In May 2017, an off-site BCP testing exercise involving participants from cross-functional departments was conducted to test and verify the effectiveness of the BCP and to identify areas for improvements in the critical business processes of the CAO Group. With the assistance of the Audit Committee and the Risk Management Committee, the Board reviews the adequacy and integrity of those control systems from time to time. Corporate Policy on Anti-Money Laundering Measures, including the appointment of an Anti- Money Laundering Compliance Officer, together with other trading related policies such as Out-of-Office Dealing Policy, Telephone Taping/Instant Messaging/Mobile Phone Policy, Deal Entry Policy, CAO Group Trade Sanctions Policy and CAO Group Corporate Guarantee Policy had been endorsed by the Risk Management Committee and relevant departments had also been mandated with the responsibility to oversee the adoption of the aforesaid policies in their practices, processes and operations. As discussed under Principle 13, the internal audit function of the CAO Group which is outsourced to BDO assists the Audit Committee and the Board in evaluating the internal control systems and processes, financial and accounting matters, compliance and business and financial risk management. The Audit Committee’s responsibilities in the CAO Group’s internal controls are complemented by the work of the outsourced Internal Auditors, BDO, the Compliance and Internal Audit department, the Risk Management department and the Legal department. Based on the audit reports, internal control systems review report and management controls in place, the Audit Committee is satisfied that the internal control systems provide reasonable assurance that assets are safeguarded, that proper accounting records are maintained and financial statements are reliable. In line with the Singapore Standards on Auditing issued in July 2015, the Company’s external auditors, Deloitte, will disclose key audit matters in the auditor’s reports on the financial statements which include matters that were of most significance in the audit of the financial statements for the financial year ended 31 December 2017 (the “Key Audit Matters”). In addition, BDO which had been engaged to conduct a review of the internal control systems and processes of the CAO Group will highlight any internal control weaknesses which have come to their attention in the course of their review. Any such audit findings noted during the audit by external auditors or internal control weaknesses noted during the review by BDO, and recommendations in relation thereto, if any, by the external auditors and BDO respectively, are reported to the Audit Committee. (ii) the effectiveness of the CAO Group risk management and internal control systems. (iii) compliance with applicable laws and regulations. The Board notes that the system of internal controls provides reasonable, but not absolute, assurance that the CAO Group will not be affected by any event that could be reasonably foreseen as it strives to achieve its business objectives and goals. In this regard, the Board also notes that no system can provide absolute assurance against the occurrence of material errors, poor judgement in decision-making, human error, fraud or other irregularities. (1) Mr Li Yongji was appointed as Vice Chairman of the Audit Committee in place of Dr Zhao Shousen on 5 February 2018. (2) Mr David Windle was appointed as a member of the Audit Committee in place of Mr Felipe Arbelaez on 28 July 2017.
to review both the Company and the CAO Group’s financials and audit reports. A key issue for discussion is the financial statements and announcements made by the Company to shareholders. The members of the Audit Committee, collectively, have expertise or experience in financial management and are qualified to discharge the Audit Committee’s responsibilities. The Audit Committee met with both the external and internal auditors at least once without the presence of the Management. The Audit Committee reviews the quarterly and annual financial statements and the integrity of financial reporting of the Company, including the accounting principles, for recommendation to the Board for approval. The Audit Committee also reviews and approves the internal auditor’s and external auditor’s plans to ensure that the plans adequately cover, in particular, significant internal controls of the Company relating to financial, operational and compliance-related matters. Significant issues are discussed at Audit Committee meetings. The Audit Committee has full authority to investigate into any matter within its terms of reference, including any suspected fraud or irregularity, or suspected infringement of any relevant laws, rules or regulations. the internal auditors’ plans and external auditors’ plans to ensure that these plans adequately cover, in particular, significant internal controls of the Company relating to financial, operational and compliance-related matters. Significant issues are discussed at Audit Committee meetings. The Audit Committee has full access to and co-operation of the Management. The Audit Committee also has full discretion to invite any Director or executive officer from the Company or the CAO Group to attend its meetings. The Audit Committee has full access to both external and internal auditors. Where required, the Audit Committee is empowered to obtain external legal advice or such other independent professional advice as the Audit Committee deems necessary. 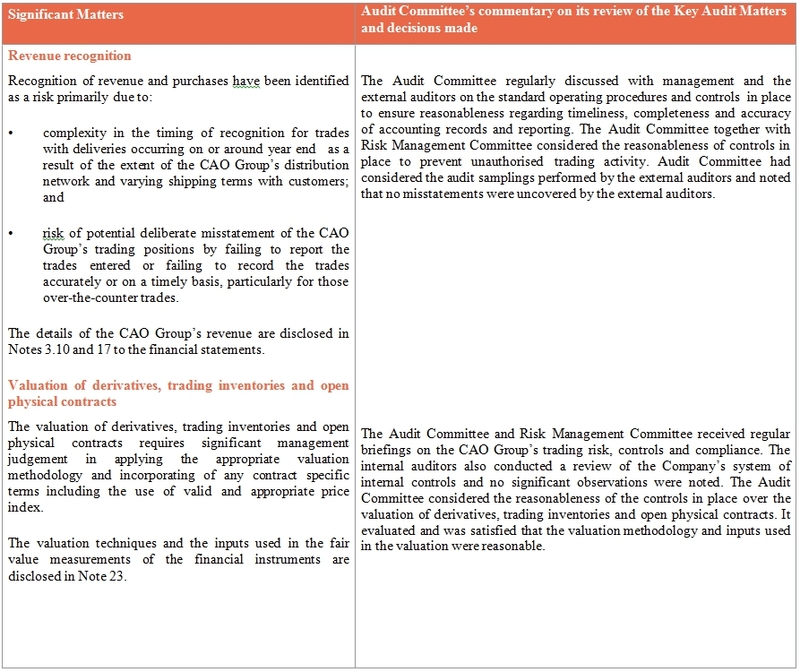 The Audit Committee monitors all interested person transactions, including transactions under the general mandate on Interested Person Transactions approved by shareholders at the AGM held in April 2017, and conflict of interest situations including transactions, procedures or actions taken which may raise issues about the Management’s integrity. The Audit Committee also evaluates the scope and results of internal audit reports as well as Management’s responses to the findings of the internal audit reports. For further discussions about internal audit, please see section (D) INTERNAL CONTROLS. The Audit Committee has also conducted an annual review of non-audit services and is satisfied that the nature and extent of such services provided by Deloitte will not prejudice their independence and objectivity before confirming their re-nomination. The Board had proposed to re-appoint Deloitte & Touche LLP as auditors of the Company for the financial year 2018. The Company has put in place a suitable whistle blowing policy and procedure, by which staff of the CAO Group as well as other persons such as suppliers of the CAO Group (the “Stakeholders”) may, in confidence, raise genuine concerns about possible improprieties regarding financial reporting or other matters (the “CAO Whistle-Blowing Policy”). The CAO Whistle Blowing Policy provides for an anonymous channel to Stakeholders to raise any such concerns to the Company without fear of reprisal. Any such concerns raised will be investigated at the discretion of the Investigating Committee set up under the CAO Whistle-Blowing Policy. In this regard, a summary of the CAO Whistle Blowing Policy can be accessed from the Company’s external website and a dedicated email address whistle_blowing@caosco.com for persons to report concerns pertaining to any form of misconduct affecting the CAO Group, its customers, partners, suppliers and other stakeholders, had been disclosed in its website. Once an email has been received at the email address set out above, an investigating committee will be responsible for investigating the concern raised. The Company had established and implemented the Crisis Management and Business Continuity Plan, Fraud Control Plan and an Enterprise Risk Management Framework and Process. The Crisis Management and Business Continuity Plan provides the CAO Group with a structured process for limiting the intensity or impact of negative threat or event to its employees, products, services, investments, financial stability and reputation. The Fraud Control Plan comprises periodic fraud risk assessments on the Company which is subject to review from time to time. The Enterprise Risk Management Framework and Process ensures that the Company has a structured approach and framework to regularly assess its enterprise-wide risks. Enterprise Risk Assessments are conducted on a regular basis to identify and deliver an inventory of key risks for the Company and to develop a list of key risk indicators that can help the Company monitor and mitigate its key risks. In addition, other existing policies, internal guidelines and/or processes and procedures have been put in place by the Company and these include the Strategy and Investment Governance Standards & Strategy and Investment Governance Committee, IT Policy & Practice, Jet Fuel Marketing Policy and Safety, Health and Environment Policy. The Company has put in place an employee handbook which includes a code of business conduct and ethics for employees. Both the Board and the Audit Committee agree that it is important to have a strong professional internal audit function to enhance their ability to manage risk and safeguard shareholders’ interest. It has been determined that the best approach is to engage independent professional auditors to discharge this function and such, BDO has been retained as the Internal Auditors of the CAO Group. During the financial year, BDO reviewed the Company’s processes and procedures on a continual basis to ensure compliance with the best corporate governance practices. It also reviewed interested person transactions on a quarterly basis. The Audit Committee is satisfied that BDO had adequate resources to perform its functions and had appropriate standing within the Company. BDO had presented their internal audit plan 2018 to the Audit Committee. The Audit Committee adopted the audit plan for 2018. As the Internal Auditors of the CAO Group, BDO had conducted its internal audits in accordance with BDO’s global internal audit methodology which is aligned with the Standards for the Professional Practice of Internal Auditing set by The Institute of Internal Auditors. The Board is careful to observe regulations of the SGX-ST governing the requirements to make appropriate announcements on a timely basis. Transparency and integrity of information is also important to the Board. All material announcements are vetted by the CEO/ED, in consultation with the Chairman and/or the Deputy Chairman, as may be required, before release by the Company via SGXnet. The CAO Group is committed to providing regular, effective and fair communication with its shareholders and the investment community. During the financial year and in line with the CAO Investor Relations Policy, the Company, through the Investor Relations team and senior management maintained active working relationships with domestic and international brokerage firms, investment banks and the media, regardless of their views or recommendations on the CAO Group. In order to: (i) cultivate wider investing public’s familiarity with the CAO Group; (ii) increase global awareness and appreciation of CAO’s business strategy, corporate developments, growth strategies and financial performance; and (iii) enhance the quantity and quality of analysts’ research, CAO expanded its channels of communication with the international investment and financial community. Increased interactions were conducted through international conferences, face-to-face meetings, teleconferences, earnings briefings and corporate access events which were webcast globally across international financial markets. The Company reviews an analyst’s report for factual accuracy of information that is within the public domain but does not provide focused guidance for analysts’ earnings estimates, and will not comment on their conclusions, earnings estimates, or investment recommendations. As a matter of internal policy, the Company will not deny an analyst or investor access to information on the basis of a negative recommendation or a decision no longer to hold the Company’s securities. The Company shall not attempt to influence an analyst to change his or her recommendations by exerting pressure through other business relationships. The Investor Relations Department will publish and maintain a list on the Company website showing names of analysts and firms providing coverage. Channels of communication with retail investors were made through email correspondence and telephone calls as well as participation in investor conferences. During the year, the Company also participated in several corporate profile seminars for both retail and institutional investors, including investor education seminar organised by SGX-ST.
Access Day 2017 was held on 21 September 2017 to an audience of about 100 persons on the topic “Enabling Growth through CAO’s Global Integrated Value Chain”. The event was also webcast internationally to overseas financial markets through CAO’s corporate website. CAO aims to hold its Corporate Access Day annually to provide our shareholders and the investment community a deeper insight into key facets of CAO’s businesses and corporate strategy as well as an update on CAO’s roadmap as it envisions to becoming a global transportation fuels provider. The Company also engages the media and investment community through news releases and half yearly media/analysts briefings after each announcement of the CAO Group’s financial results. To assist members of the Board to gain a current understanding of the views of institutional shareholders, the Board receives at each its scheduled quarterly meetings, (i) an investor relations and corporate communications report which cover a wide range of matters including a commentary on the perception of the Company and views expressed by the investment community, media reports, share price performance and analysis, share ownership analysis, highlights of recent investor relation activities; and (ii) a half-yearly peer companies analysis report which provides a detailed analysis and evaluation on the benchmarking exercise with identified peer companies to provide the Board with a better understanding of CAO’s position within the industry as well as identify gaps and learning points. In addition, the Board adopted the Internal Guidelines on Issuance of Profit Guidance or Profit Warning Announcements which purpose is to allow market expectations to adjust to the likelihood that the Company will either not be living up to an earlier profit guidance, and/or to avoid an earnings shock, negative impact on the share price, sell-off of the Company’s shares and/or volatility of trading in the Company’s shares, when the financial results are announced. Companies should encourage greater shareholder participation at general meetings of shareholders and allow shareholders the opportunity to communicate their views on various matters affecting the company. The existing Constitution of the Company allows a shareholder to appoint up to two (2) proxies to attend and vote in his/her place at general meetings. Although the Company does not have a specific limit in the Constitution on the number of proxy votes for nominee companies, there is a limit for the number of proxies. Notwithstanding this, the Company allows shareholders who hold shares through nominee companies to attend the AGM as observers without being constrained by the two-proxy rule. At each AGM, shareholders are encouraged to participate in the question and answer session. The Board of Directors, senior management, the external auditors, internal auditors and the Company Secretary are present to respond to shareholders'questions. Where there are items of special business to be transacted at the AGM, comprehensive explanatory notes will be sent together with the notice of the AGM. Each issue or matter requiring the approval of shareholders of the Company is submitted as a single item resolution. To ensure transparency, the Company conducts electronic poll voting for shareholders/proxies present at the meeting for all the resolutions proposed at the general meeting. Votes cast for or against and the respective percentages on each resolution will be tallied and displayed live on screen immediately at the general meeting. The total number of votes cast for or against the resolutions and the respective percentages are also announced after the general meeting via SGXnet. The Company Secretary prepares minutes of shareholders’ meetings, which incorporates substantial comments or queries from shareholders and responses from the Board and Management. These minutes can be accessed from the Company’s external website. Shareholders also have the opportunity to communicate their views and discuss with the Board and the Management matters affecting the Company after the general meetings. The Constitution of the Company can be accessed from the Company’s external website. The dividend policy of the Company (the “CAO Dividend Policy”) sets out the guiding principles for dividend distribution by the Company (the “Guiding Principles”). The Guiding Principles included inter alia, maintaining a consistent baseline dividend payout ratio which constitutes 30 percent of the Company’s annual consolidated net profits attributable to shareholders commencing from the financial year 2016. (c) any regulatory approvals and/or where applicable, approvals required from third parties (e.g. banks and other financial institutions) as appropriate. A summary of the Revised CAO Dividend Policy can be accessed from the Company’s external website. In line with the recommended best practices on dealings in securities set out under Rule 1207(18) of the SGX-ST Listing Manual, the Company has issued a directive to all employees and directors not to deal in the Company’s securities on short-term considerations and to abstain from dealing with the Company’s securities for a period commencing two (2) weeks before the announcement of the results of the first three (3) quarters and one (1) month before the announcement of the full year results and ending on the date of the announcement of the relevant results. Shareholders have approved the renewal of the general mandate for interested person transactions of the CAO Group on 18 April 2017 (the “IPT Mandate”). The IPT Mandate sets out the levels and procedures to obtain approval for such transactions. Information regarding the IPT Mandate is available on the Company’s website at www.caosco.com. All business units are required to be familiar with the IPT Mandate and report any such transactions to the Finance Department. The Finance Department keeps a register of the CAO Group’s interested person transactions. Information on interested person transactions for 2017 is found under “Supplementary Information” on page 189. As part of the Company’s ongoing process of ensuring effectiveness of its system of internal controls, the established system of internal controls of the Company is subject to biennial review by an independent external reviewer with appropriate experience in corporate governance and risk management processes. With the assistance of BDO, the Company conducted a review of the Company’s system of internal controls (the “Review of System of Internal Controls”). Based on the findings from the Review of System of Internal Controls, the Company was generally in conformity with Committee of Sponsoring Organizations of the Treadway Commission (the “COSO”) Internal Controls Integrated Framework. Risks identified (none of which were rated as high risk) are highlighted in the Risk Assessment section in its report. No other exceptions were noted with respect to internal controls and counter-measures reviewed in the scope of the engagement. However, BDO had recommended several areas of improvement so as to fully conform to the requirements under the COSO internal controls framework. Accordingly, Management had carefully considered these recommendations from BDO and had taken the necessary actions to implement the same as appropriate. The Company shall have a Lead Independent Director who shall be an independent director as defined under the 2012 Code. In circumstances where the Chairman of the Board of Directors is not independent, the Board of Directors of the Company considers it to be useful and appropriate to designate a Lead Independent Director to coordinate the activities of the Independent Directors of the Company and perform such other duties and responsibilities as the Board may determine from time to time. • Act as the principal liaison between the Independent Directors of the Company and the Chairman of the Board, and between the Independent Directors of the Company and senior management. • Has the authority to convene meetings, as appropriate, among the Independent Directors of the Company and to ensure that Independent Directors have adequate opportunities to meet and discuss issues in sessions of the Independent Directors without the presence or participation of management. • Preside at any meetings held among the Independent Directors of the Company. • Review the quality, quantity and timeliness of the information submitted to the Board and Board Committees. • Advise and assist the Chairman on the meeting agenda items. • Advise the Chairman and facilitate Board’s approval of the number and frequency of meetings of the Board and Board Committees (including any special meetings of the Board) as well as meeting schedules to ensure that there is sufficient time for discussion of all agenda items. • Has authority to initiate actions, for and on behalf of the Independent Directors of the Company, to address any concerns on corporate compliance matters including the engaging of external advisers and consultants, even at the displeasure of the Management or majority shareholders of the Company. • Respond directly to the shareholders of the Company, questions and comments that are directed to the Lead Independent Director or to the Independent Directors of the Company as a group, with such consultation with the Chairman of the Board and the other Non-Independent Directors, as the Lead Independent Director may deem appropriate.